Given the clutter in the field of Communication today, it is essential to be heard above the noise and we at Blue Lotus Communications believe that nothing speaks louder than the absolute truth. We have, since our inception, laid the foundations of all strategy in "Trust". PR is essentially, when you strip it down to a molecular level, a trust-building mechanism. Trust, in its most basic form, is the quality of anything being considered believable. Over time, the evident notations of Trust in business (pedigree, size, performance, and so on) have changed and subtle ones now exert stronger influences. 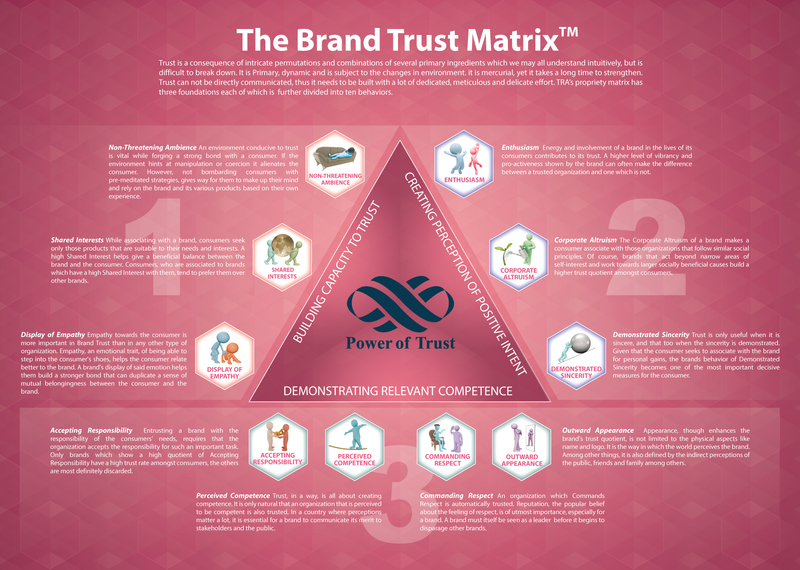 It is essential for a business to understand trust and where it lies on the Trust Matrix to know what Public Relations strategies it can best employ to increase the already existing trust in its stakeholders, to influence a wider newer circle of followers, and most importantly to increase its overall standing in trust. The first foundation of trust emphasizes on the need for an entity to create an environment conducive to trust, wherein the eventual goals of the entity are aligned with those of its stakeholders to increase a sense of association that is crucial to developing a sense of mutual understanding and a sense of purpose towards common goals for a congruence of values, beliefs, and thoughts. The second foundation deals with one of the key ingredients for the best possible "PR health" prescription for a business entity – to be seen as having a positive impact on its environment and those associated directly or indirectly with it. An enthusiastic entity perceived as actively interested in social good will gather more following as it is seen as working towards the greater good. In several cases, businesses have been revived from the brink of obliteration from the public eye by a well-timed, genuine endeavor towards investing thought and effort towards the betterment of society. The final foundation of trust deals with a business entity putting their money where their mouth is. It is of utmost importance that the claims of the entity are backed up with strong results. There should be no dissonance between what they are and what they are trying to assert themselves as. A business entity needs to etch its image in the public mind such that they are well respected hence credible, and in case of any pitfall can be relied upon to accept the responsibility and draw from the experience to improve themselves. During times of crisis, it is essential that these aspects are communicated to maintain the image of the business. Trust can be built, retained, reinforced, and revived regardless of which stage the business is in. If it is a budding new enterprise or an industry stalwart. If it is in times of crisis, reviving its image, or reinforcing its brand image. Or if it is attempting to sustain the trust it has gathered over a period of time or infusing it with a new impetus towards an unchartered territory. To better understand how Trust fits in the scheme of things, one must demarcate which stage the business entity is in to best derive a strategy that will have the highest impact – quite like the stages of social interaction and development in life, where an individual at first only gets a grasp of how to sustain and fulfil his most basic needs of self-preservation. In the initial stage, a new business's communication depends solely on its instinct-driven strategy and affects only its immediate stakeholders, those who directly impact its survival. 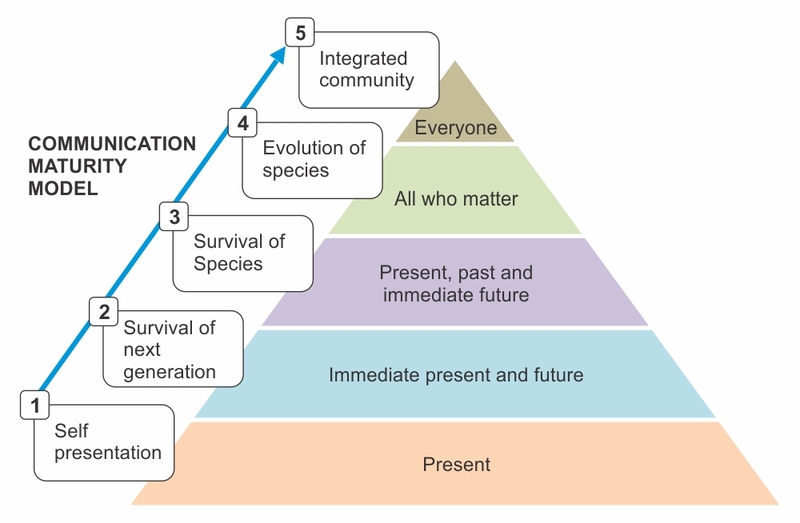 The second stage is where organizations have an outlook to the future, but their perspective is limited to the survival of the organization’s next generation. This stage usually reflects a highly competitive growth for companies, where almost everyone in the sector is competing with everyone else. It is essential in this stage to have clutter-breaking communication strategies based on a strong foundation to not only capture mind space in its key stakeholders but also to sustain it for the future. For an organization to mature into the third stage, it must traverse a significant distance in changing its own people’s mindset, behavior, and the way they interact with the world. Companies in the third stage of communication maturity are knowledge organizations; they delve into their past and use this learning to improve their future. Though still largely inward looking, such organizations are willing to learn from other companies within the sector if they get the chance. These transition companies are willing to share the knowledge and they have begun walking the bridge that meets the internal with the external. Such organizations are also operationally driven and pushed by quantitative metrics and maintain a fast growth pace. They are usually progressive and are proactive users of communication. To progress to the fourth stage of maturity, companies must find the communication partner that best understands them to assist them in adopting an inclusive worldview and approach where their worldview transforms from a ‘mirror approach’ to a ‘window approach’. From being exclusive and internally obsessed, the worldview of the organization becomes inclusive and its actions include an active component of learning in their approach to business. Such organizations understand that their survival and that of the sector depends on sharing and collaborating. Competition between companies is less fierce each with a completely differentiated offering. The company attempts to collaborate, share, and innovate in a manner that drives further growth for all. Organizations are seen as sector leaders and act as beacon-bearers for the industry. Such a worldview includes its entire sector with an understanding that the part automatically benefits as a result of any benefit to the whole. The organization’s communication with the sector and its stakeholders is now its prime consideration. In this stage of evolution, sharing is abundant, though knowledge crossovers from other sectors remain restricted. The most evolved stage of an organizational worldview is when it understands that every entity impacts every other in some way. The belief that each has the potential to impact the other puts the entire organizational focus solely on intangibles. In this stage, the organization is at a heightened state of awareness and will instinctively do and communicate only the ‘right’ things. Such organizations are evolved entities. They are extremely goodperformers and the core of their organization is based on knowledge and innovation. They have gained the trust of all audiences, not just their ‘targets’. Such companies communicate only what is led by their values and credo. Typically, such entities lead a generation of organizations, people, and thoughts through their actions and communication. Regardless of which stage the organization is in, it needs the ideal balance of trust for it to sustain and grow, which is dependent on certain key factors – which stage the organization is in, the nature of its industry and the current environment of the category it belongs to, where it lies on the spectrum of trust, and most importantly where it sees itself both in the immediate future as well as its long term goals. At Blue Lotus, we have been successful at understanding organizations, businesses, and personalities for almost a decade now, and we help them achieve their goals of communication. Crisis is a part of the natural lifecycle of brands. ‘Crisis’ is termed so because it comes unexpectedly, has not been experienced before, has the potential to cause substantial harm, and cannot be solved in a jiffy. All types of crisis, no matter how potentially harmful, have a very significant learning component to them. In fact, the greater the crisis, the greater the degree of learning from it. That which has the greatest potential to harm gets etched deeper in the mind, perhaps to ensure better crisis avoidance the next time. At Blue Lotus, we classify Crisis Containment into four main steps – Anticipate, Participate, Mitigate, and Rehabilitate. Each of these steps has two sub-steps; the exception is Participate, which has only one sub-step. The image that follows is a visual aid. 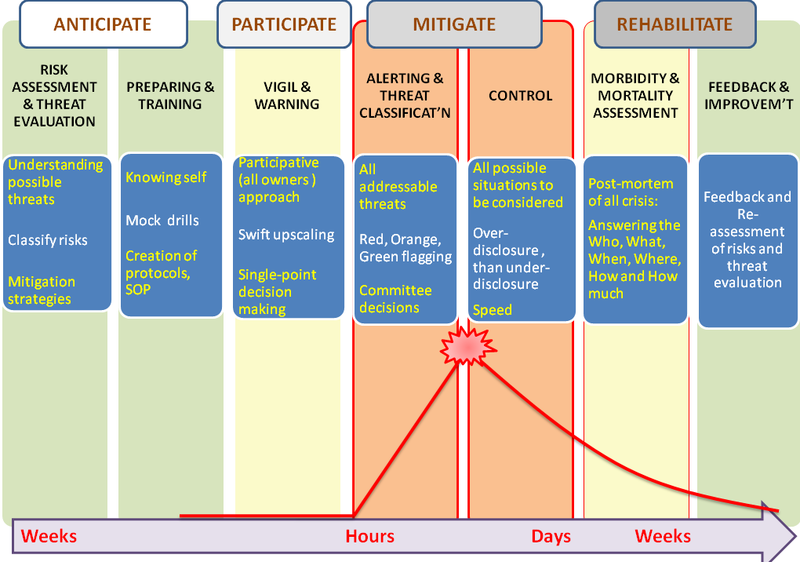 The first phase, Risk Assessment and Threat Evaluation, assesses all possible risks specific to the organization and classifies them into threat groups – Red, Orange, and Green. This anticipatory step naturally cannot predict all the possible crisis scenarios that may occur, but it gives the organization and the PR agency a relatively good idea of what to expect. To create a comprehensive risks’ list, it helps to have a live session with the top management of the company. After a brief explanation of the process of crisis, each participant is asked to list out the three biggest threats that they foresee in their department that could potentially bring an image risk to the company. Once listing is complete, they shortlist their own Red Flag threat. After that, these lists are discussed further and a final, shortlisted Red Flag list for the organization is created. The other threats are similarly classified into Orange and Yellow flags. A set of mock media drills is created for the spokespersons and drills are conducted for two or three identified threats, which help them get the context when responding to threats in real time. This step is a vigil and warning step, where it is essential for the grassroots to keep an ear to the ground. It is important for the grassroot to understand the clients’ logic of messaging as also the general media strategy. Media teams across the nation need to be vigilant for any adverse news about the company or the industry. Strong media relations and an open approach help in getting advance notice from the media regarding any impending media-related issues. Of late, survival pressures of several smaller media houses have given them the tendency to push any negative news, without even a proper evaluation of the content. Seven out of ten media crises are due to misinterpretation and misrepresentation. At Blue Lotus, we believe that it is necessary to treat every crisis as important, no matter how big or small. Crisis containment is an evolving plan and every learning needs to be adopted. It is equally important in a crisis situation to ensure that the protocols of Red, Orange, and Green escalation be maintained with all Red situations being discussed for the plan evolution. One important observation that comes from the various experiences that Blue Lotus has had is that the usual standoff is with the legal viewpoint (of under-disclosure or to-the-point disclosure). It must be noted that from our viewpoint, for effectively regaining lost reputation and Brand Trust®, over-disclosure may be the way to go in most cases, rather than under-disclosure. Popular theory has it that the IQ of a person (or corporate) falls to 10% when faced with acute adversity. Is there a way that we can add to the intelligence by learning from adversity? Is there a way that we can end up adding IQ points when faced with a situation of adversity? When any company loses clients, markets, mindshare, or reputation, it is unfortunate that very few do a serious introspection to understand what really happened.At Blue Lotus, we categorize crisis learning into two categories, subtle and gross. Gross learning happens by pure observation of a new crisis. On the other hand, subtle learning in crisis happens due to experimentation or observation of mistakes and critically analyzing the mistakes. The learning-adversity connection in the corporate environment often gets missed as these environments witness a continuous intermeshing of casualties and growth. While learning is a continuous process, momentous adversity can provide enough fodder for learning, improvement, and growth.